The department of Mass Communication is under the Faculty of Management and Social Sciences in Godfrey Okoye University. The department offers a 4-year programme for the award of Bachelor of Science (B.Sc.) degree. 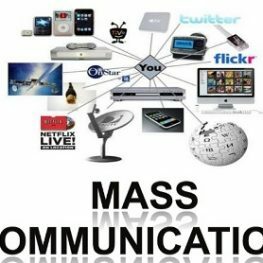 The philosophy of Mass Communication is influenced by the university’s motto “Unity of Knowledge”, we will, therefore, create a Mass Communication programme that is capable of transforming the society for the good of humanity. It is our goal to build a Mass Communication programme that will equip graduates to impact positively on the lives of individuals, the nation, and the world at large based on the principles of unity. The programme is charged with the responsibility of incubating, hatching and grooming students who would be good mass communicators, knowledgeable in theories that seek to explain models and processes that uncover behavioral patterns in the lives of people. 1. Five credits in WASSCE/NECO or GCE/0’level obtained in not more than two sittings. These credits must include, English and Mathematics, and three other relevant subjects. 2. An acceptable pass in the UTME entrance Examination. Direct Entry: Candidates for Direct Entry admission shall possess five credit passes in the SSCE, NECO, GCE or equivalents of which at least two shall be at advanced level , or four credits passes of which at least three shall be at advanced level provided that such passes are not counted at both levels of the examinations. For emphasis credit passes in English Language, Mathematics, Economics and any of Government or History is compulsory. All students must fulfil the basic entry requirements of the university. The programme’s duration is four years for general entry students and three years for direct entrants. Deg 1 PUB 161 Nigerian Legal System I, 2 units. Deg 1 PSY 101 Introduction to Psychology I, 2 unit. Deg 1 SOC 101 Introduction to Sociology I, 2 units. Deg 2 MAC 211 News Writing and Reporting,2 units. Deg 2 MAC 213 Specialized Reporting, 2 units. Deg 2 MAC 219 Editorial Writing, 2 units. Deg 2 MAC 225 Announcing and Performance, 2 units. Deg 2 MAC 251 Theories of Mass Communication, 2 units. Deg 2 SOC 201 Statistics for Social Science I, 2 units. Deg 3 MAC 301 Communication and Society, 2 units. Deg 3 MAC 303 Science & Technology Reporting, 2 units. Deg 3 MAC 311 Radio/TV Writing Product.&Programm, 2 units. Deg 3 MAC 323 Broadcast Management & Production, 2 units. Deg 3 MAC 331 International Communication, 2 units. Deg 3 MAC 333 Newspaper Management & Production, 2 units. Deg 3 MAC 371 Mass Communication Research, 2 units. Deg 4 MAC 401 Mass Media Law and Ethics, 2 units. Deg 4 MAC 403 Mass Comm. & National Development,2 units. Deg 4 MAC 405 Rural Communication, 2 units. Deg 4 MAC 421 Issues in Broadcast (Seminar), 2 units. Deg 4 MAC 423 Drama & Documentary Production, 2 units. Deg 4 MAC 441 Econs & Social Issues in Advert & P. R, 2 units. Deg 4 MAC 471 Public Opinion Research, 2 units. Deg 4 MAC 473 Data Analysis in Communication, 2 units.